A thrift based feature representation that enables pairwise ranking loss and single context multiple item representation. Having interpretable models lets you iterate quickly. Figure out where the model disagrees most and have insight into what kind of new features are needed. Debugging noisy features. By plotting the feature weights you can discover buggy features or fit them to splines and discover features that are unexpectedly complex (which usually indicates overfitting). You can discover relationships between different variables and your target prediction. e.g. 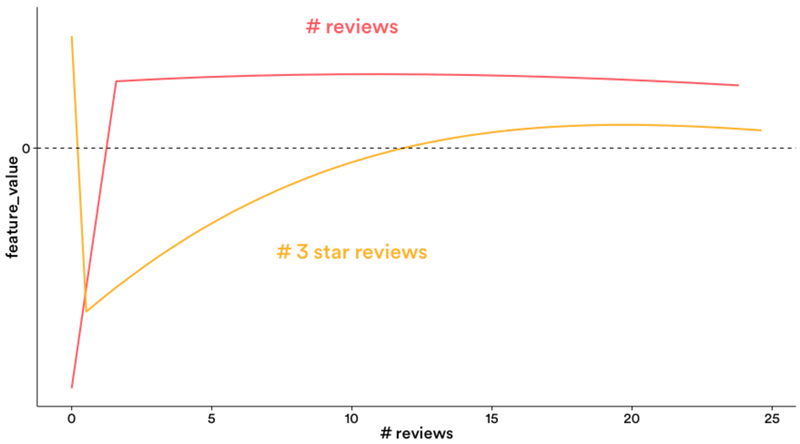 For the Airbnb demand model, plotting graphs of reviews and 3-star reviews is more interpretable than many nested if then else rules. The artifacts for aerosolve are hosted on bintray. If you use Maven, SBT or Gradle you can just point to bintray as a repository and automatically fetch the artifacts. Check out the image impression demo where you can learn how to teach the algorithm to paint in the pointillism style of painting. Image Impressionism Demo. There is also an income prediction demo based on a popular machine learning benchmark. Income Prediction Demo. This section dives into the thrift based feature representation. Features are grouped into logical groups called families of features. The reason for this is so we can express transformations on an entire feature family at once or interact two different families of features together to create a new feature family. denseFeatures - this is a map of feature family to a dense array of floats. Not really used except for the image content analysis code. context - this is a FeatureVector that occurs once in the example. It could be the features representing a search session for example. e.g. "Keyword" -> "Free parking"
example(0..N) - this is a repeated list of FeatureVectors that represent the items being scored. These can correspond to documents in a search session. e.g. "LISTING CITY" -> "San Francisco"
This section dives into the feature transform language. Feature transforms are applied with a separate transformer module that is decoupled from the model. This allows the user to break apart transforms or transform data ahead of time of scoring for example. e.g. in an application the items in a corpus may be transformed ahead of time and stored, while the context is not known until runtime. Then at runtime, one can transform the context and combined them with each transformed item to get the final feature vector that is then fed to the models. Feature transforms allow us to modify FeatureVectors on the fly. This allows engineers to rapidly iterate on feature engineering quickly and in a controlled way. Cross transform. Operates only on stringFeatures. Allows interactions between two different string feature families. e.g. "Keyword" cross "LISTING CITY" creates the new feature family "Keyword_x_city" -> "Free parking^San Francisco"
Multiscale grid transform Constructs multiple nested grids for 2D coordinates. Useful for modelling geography. Please see the corresponding unit tests as to what these transforms do, what kind of features they operate on and what kind of config they expect. This section covers debuggable models. Although there are several models in the model directory only two are the main debuggable models. The rest are experimental or sub-models that create transforms for the interpretable models. Linear model. Supports hinge, logistic, epsilon insensitive regression, ranking loss functions. Only operates on stringFeatures. The label for the task is stored in a special feature family and specified by rank_key in the config. See the linear model unit tests on how to set up the models. Note that in conjunction with quantization and crosses you can get incredible amounts of complexity from the "linear" model, so it is not actually your regular linear model but something more complex and can be thought of as a bushy, very wide decision tree with millions of branches. Boosted stumps model - small compact model. Not very interpretable but at small sizes useful for feature selection. Decision tree model - in memory only. Mostly used to generate transforms for the linear or spline model. Maxout neural network model. Experimental and mostly used as a comparison baseline. If you use intellij, try build first, so that thrift classes is available and to fix the spark compiling error inside intellij, type command+; and click dependency and change related files from test to compile, such as org.apache.spark and org.apache.hadoop:hadoop-common. We keep gradle config as testCompile so that to reduce jar file size. Organizations and projects using aerosolve can list themselves here.